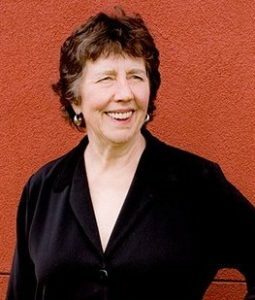 This special concert celebrates Grammy-winning composer Joan Tower on her 80th birthday year, with the Jasper String Quartet, flutist Carol Wincenc, pianist Blair McMillen, violinist Leonardo Pineda, and two of Joan Tower’s students — Christopher Beroes-Haigis and Corey Chang — who have written short pieces for the occasion. The program will include premieres of three new compositions, one by Joan Tower and one each by Chang and Beroes-Haigis. Winner of the prestigious CMA Cleveland Quartet Award, Philadelphia’s Jasper String Quartet is the Professional Quartet in Residence at Temple University’s Center for Gifted Young Musicians and the 2017-18 Guest Artist in Residence at Swarthmore College. The Jaspers have been hailed as “sonically delightful and expressively compelling” (The Strad) and the New York Times named their latest album, Unbound, as one of the 25 Best Classical Recordings of 2017. The Quartet launched their inaugural season of Jasper Chamber Concerts in 2016-17, a series in Philadelphia devoted to world class performances of masterworks from around the world and Philadelphia. The Quartet continues with the second season in 2017-18. The Jasper String Quartet also looks forward to their 2019 commission of Lera Auerbach, Akira Nishimura, Chris Theofanidis and Joan Tower for 4 Seasons | 4 composers, a work bringing the brilliant muse of the seasons to the string quartet genre. The Quartet completed their latest commission tour of Aaron Jay Kernis’ 3rd String Quartet “River” in 2017 at Wigmore Hall and their Carnegie Hall Recital with the work received a glowing review in The Strad. The Jasper String Quartet’s next album on Sono Luminus will feature Kernis Quartet No. 3 and Debussy Quartet. This, their 5th album, completes the Kernis Quartet Cycle and adds to their recordings of Beethoven Op. 59, No. 3, Beethoven Op. 131 and Schubert Death and the Maiden. Their 2017 album, Unbound, features the first recordings of quartets by Donnacha Dennehy, Annie Gosfield, Judd Greenstein, Ted Hearne, David Lang, Missy Mazzoli and Caroline Shaw. The Quartet has performed hundreds of outreach programs in schools and enjoys educational work of all types. In 2018, the Quartet received their second Picasso Project Grant from Public Citizens for Children and Youth. This grant supports the Quartet’s work with a South Philadelphia Public Elementary throughout the spring, culminating in a performance together. In addition, Fischoff National Chamber Music Association recognized the Quartet’s “outstanding and imaginative programming for children and youth in the United States” with their 2016 Educator Award. In 2008, the Jaspers swept through the competition circuit, winning the Grand Prize and the Audience Prize in the Plowman Chamber Music Competition, the Grand Prize at the Coleman Competition, First Prize at Chamber Music Yellow Springs, and the Silver Medal at the 2008 and 2009 Fischoff Chamber Music Competitions. They were also the first ensemble honored with Yale School of Music’s Horatio Parker Memorial Prize, an award established in 1945 and selected by the faculty for “best fulfilling… lofty musical ideals.” In 2010, they joined the roster of Astral Artists after winning their national auditions. The Quartet was the 2010-12 Ensemble-in-Residence at Oberlin Conservatory and, in conjunction with Astral Artists, was awarded a 2012 Chamber Music America grant through its Residency Partnership Program for work in Philadelphia schools. From 2009-2011, the Jaspers were the Ernst C. Stiefel String Quartet-in-Residence at the Caramoor Center for Music and Arts (Katonah, NY). They were the first ensemble to be invited for a second year as such. The Jaspers perform pieces emotionally significant to its members ranging from Haydn and Beethoven through Berg, Ligeti, and living composers. They have commissioned string quartets from some of today’s best composers, including Aaron Jay Kernis, Andrew Norman, Nicholas Omiccioli, Conrad Tao and Annie Gosfield. 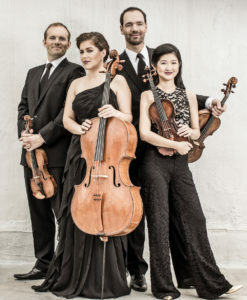 Critics and audiences commend the Jasper String Quartet’s “programming savvy” (clevelandclassical.com) and they have performed throughout the United States and in Canada, England, Italy, Japan, Korea, Norway and Panama. Formed at Oberlin Conservatory, the Jaspers began pursuing a professional career in 2006 while studying with James Dunham, Norman Fischer, and Kenneth Goldsmith as Rice University’s Graduate Quartet-in-Residence. In 2008, the quartet continued its training with the Tokyo String Quartet as Yale University’s Graduate Quartet-in-Residence. The Jasper String Quartet is named after Jasper National Park in Alberta, Canada and is represented exclusively by Dispeker Artists. For more information, please visit www.jasperquartet.com or www.facebook.com/jasperstringquartet. From 1969 to 1984, she was pianist and founding member of the Naumburg Award-winning Da Capo Chamber Players, which commissioned and premiered many of her most popular works. Her first orchestral work, Sequoia, quickly entered the repertory. Tower’s tremendously popular five Fanfares for the Uncommon Woman have been played by over 500 different ensembles. She is currently Asher Edelman Professor of Music at Bard College, where she has taught since 1972. Her composer-residencies with orchestras and festivals include a decade with the Orchestra of St. Luke’s, the Pittsburgh Symphony Orchestra’s Composer of the Year for their 2010-2011 season, as well as the St. Louis Symphony, the Deer Valley Music Festival, and the Yale/Norfolk Chamber Music Festival. She is in residence as the Albany Symphony’s Mentor Composer partner in the 2013-14 season. Her recent premieres include: Purple Rush (2016), commissioned by the Chamber Music Society of Lincoln Center and premiered by Paul Neubauer, viola; Power Dance (2016), premiered by organist Michel Bouvard at the American Guild of Organists Convention; Second String Force (2014), commissioned and premiered by violinist Bella Hristova. Hailed “Queen of the Flute” (New York Magazine) at the outset of her, now, brilliant 48 year career, flutist CAROL WINCENC was First Prize Winner of the (sole) Walter W. Naumburg Solo Flute Competition, as well as the Lifetime Achievement Award recipient from the National Flute Association, the National Society of Arts and Letters Gold Medal for Lifetime Achievement in Music, and Distinguished Alumni Awards from Manhattan School of Music and the Brevard Music Center. During the past two seasons she performed, recorded and gave masterclasses as an exclusive Burkart Flutes Artist in Beijing, Shenyang, Seoul, Warsaw, Prague, Venice, Nice, and Thessoloniki. In North America she performed as soloist and chamber musician from coast to coast, including Seattle, Phoenix, Dallas, Edmonton, Banff, Iowa City, Minneapolis, New Orleans, Tucson, Palm Beach, Sarasota, Philadelphia, Boston and her home city, New York. Recently she recorded an all Uebayashi album with the award winning Escher String Quartet, and video/audios in partnership with her collaborator/pianist Bryan Wagorn of the Metropolitan Opera. Most recently she and Mr. Wagorn performed to a sold out house at Weill Carnegie Hall for the “Naumburg Looks Back” series. Delighting audiences for over four decades with her signature charismatic, high virtuosity and deeply heartfelt musicality, she has appeared as soloist with such ensembles as the Chicago, San Francisco, Pittsburgh, Detroit and London Symphonies, the BBC, Warsaw and Buffalo Philharmonics, as well as the Los Angeles, Stuttgart and Saint Paul Chamber Orchestras, the latter for which she was Principal and Solo Flute from 1972-77. She has performed in countless festivals such as Mostly Mozart, Aldeburgh, Budapest, Frankfurt, Santa Fe, Spoleto, Music at Menlo, Aspen, Yale/Norfolk, Sarasota, Banff and Marlboro. The muse of today’s most prominent composers, Ms. Wincenc has premiered numerous works written for her by legends Christopher Rouse, Henryk Gorecki, Lukas Foss, Jake Heggie, Paul Schoenfeld, Tod Machover, Yuko Uebayashi, Thea Musgrave, Andrea Clearfield, Shi-Hui Chen and Joan Tower. In great demand as a chamber musician, Ms. Wincenc has collaborated with the Emerson, Tokyo, Guarnieri, Cleveland, Juilliard and Escher String Quartets, and performed with Jessye Norman, Emanuel Ax and Yo-Yo Ma. A Grammy nominee, she has recorded for Nonesuch, London/Decca, Deutsche Grammophon, Telarc (Diapason D’Or Award), Music Masters (Recording of Special Merit with Andras Schiff) and Naxos (Grammophone Magazine “Pick of the Month with Buffalo Philharmonic). 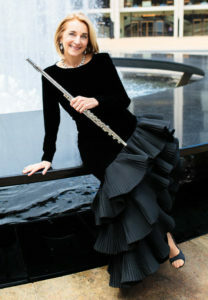 Ms. Wincenc created and directed a series of International Flute Festivals at the Ordway Theater in St. Paul, Minnesota, featuring such diverse artists as Jean-Pierre Rampal, Herbie Mann, Steven Kujala and the American Indian flutist, R. Carlos Nakai. She had the privilege of working directly with legendary music luminaries Aaron Copland, Olivier Messaien, Rudolf Serkin, Joshua Bell, Christophe Eschenbach, Loren Maazel, Michael Tilson Thomas, Philip Glass, Andre Previn, Paul Simon and Judy Collins, to name a few! She is a member of the New York Woodwind Quintet and a founding member of Les Amies with New York Philharmonic principals Nancy Allen, harpist and Cynthia Phelps, violist. Ms. Wincenc continues more than a quarter of a century on the faculties of The Juilliard School and Stony Brook University having mentored and graduated countless rising, flute stars commanding principal flute positions in major symphony orchestras and university professorships. She is renowned for her popular series of etudes and flute classics, the “Carol Wincenc 21st Century Flute” published by Lauren Keiser/Hal Leonard Music Publishers (available on ‘Amazon’). A long time resident of New York City, she is the proud mother of singer/songwriter Nicola Wincenc (Cavernsband.com). Carol Wincenc is a native of Buffalo, NY, and was raised in a deeply active, musical family, along with her two older sisters, and under the mentorship of her violinist father and symphony conductor, Dr. Joseph Wincenc, and pianist mother, Margaret Wincenc. Having concertized on five continents, Ms. Wincenc loves nothing more than “giving back” with her music-making to communities world wide. Blair McMillen has established himself as one of the most versatile and sought-after pianists today. The New York Times has described him as “riveting,” “prodigiously accomplished and exciting,” and as one of the piano’s “brilliant stars.” McMillen leads a multifarious musical life as pianist, chamber musician, conductor, and improviser. He thrives on playing a wide variety of musical styles: from medieval keyboard manuscripts to improvisation-based music of all types; from Classical/Romantic-era piano repertoire to the music of young 21st-century composers. 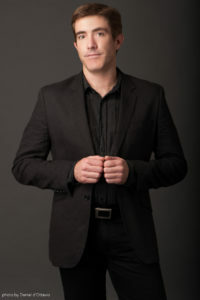 Known for imaginative and daring programming, McMillen has premiered hundreds of new works both as a soloist and with numerous ensembles. He constantly collaborates with composers and artists of other genres in commissioning works that stretch the boundaries of the piano and the traditional recital format. 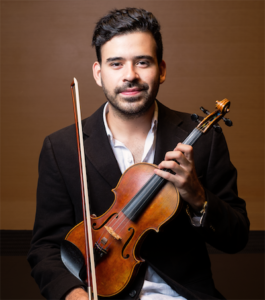 McMillen has performed in major venues both traditional and avant-garde: from Carnegie Hall, the Moscow Conservatory, Lincoln Center, Caramoor, Miller Theatre, and the Library of Congress; to (le) Poisson Rouge, Galapagos, and the Knitting Factory. Highlights from recent seasons include the Prokofiev Piano Concerto No. 1 at the Bard Music Festival, the Walter Piston Concertino for Piano in Carnegie Hall, and numerous appearances with the New York Philharmonic, St. Paul Chamber Orchestra, and Albany Symphony. 2014 also saw McMillen’s debut at the Gilmore International Keyboard Festival, where he performed a solo recital featuring Morton Feldman’s Triadic Memories right on the heels of a sold-out performance with his tour de force piano sextet, Grand Band. Blair McMillen is pianist for the Naumburg Award-winning Da Capo Chamber Players, the American Modern Ensemble, and the six piano Grand Band, among others. He is the co-founder and co-director of the Rite of Summer Music Festival, an alt-classical outdoor concert series. McMillen holds degrees from Oberlin College, the Juilliard School, and the Manhattan School of Music. He lives in New York City, and has served on the music faculty at Bard College and Conservatory since 2005.